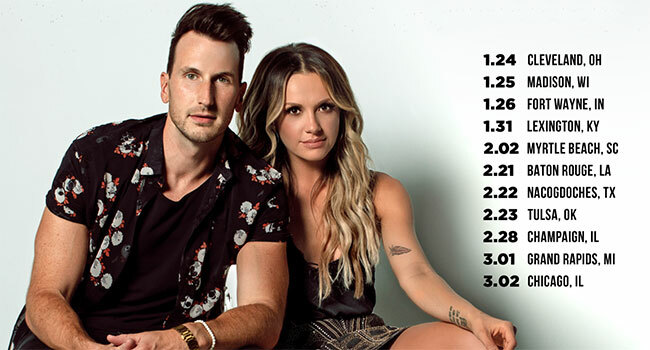 Russell Dickerson and Carly Pearce have announced that they will be embarking on an 11 city U.S. tour early next year. Kicking off on January 24, 2019 from Cleveland, OH, country music’s favorite new faces music share more than a marquee. Finding themselves in the same songwriting circles earlier in their careers, they have supported each other along the way so their parallel successes make their tour all the more exciting. Tickets will go on sale for The Way Back Tour in your city on Friday, November 9th. Dickerson is hot off two back-to-back No. 1s with his debut “Yours” and sophomore single “Blue Tacoma.” Pearce recently released “Closer To You,” the debut single from her sophomore effort coming via Big Machine Records in 2019.